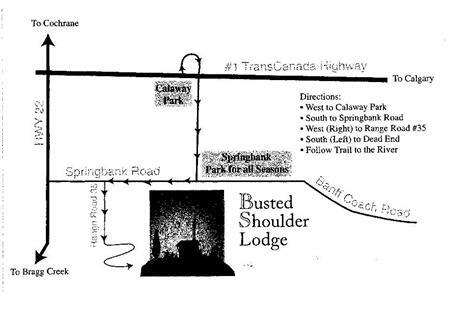 Busted Shoulder Lodge is on RR35 in Springbank: Take the TransCanada to RR33 (Calaway Park exit) Turn south onto Springbank Rd. Turn right (west) several km to RR35. Turn left (south) to the end of the gravel road. Turn left and follow road to parking field. See you there. Yahoo!